Now in its 25th year, sps ipc drives 2014 is bigger than ever before, reaffirming its position as Europe’s leading factory automation trade show. More than 1,600 exhibitors showcase their innovations, products and solutions for electric automation. For the first time, the newly built hall 3A will expand the exhibition’s events to 14 halls. sps ipc drives 2014: The exhibition covers 14 large halls and attracts more than 60,000 visitors. The new hall 3A dedicated to the topics of drive technology and sensors, thus creating a link between the existing halls 3 and 4A. As the exhibition has continued to expand, the themes covered by the various halls have altered. Industrial software has now been integrated into Hall 6 alongside mechanical infrastructure. Industrial communication is now accommodated in Hall 2, where topics such as industrial Ethernet and field bus systems are located. The entire hall 11 is now occupied by the Siemens stand. The conference offers a first-class program with keynote speeches on the topics of “Big data” and “Unconventional drives with smart materials”. Forty-eight presentations, two keynote speeches and the R&D talk, a podium discussion on the topic of “Opportunities and limitations of Industry 4.0”, focus on practical and brand-independent dialog between development and application. Get the latest news from sps ipc drives 2014 before, during and after the event. Tweets about "#SPS14 AND from:IEBook"
A selection of videos from the sps ipc drives 2014 trade show. Here are some of the new products and solutions introduced at sps ipc drives 2014. The B&R ACOPOS P3 represents an impressive progression in automation technology. 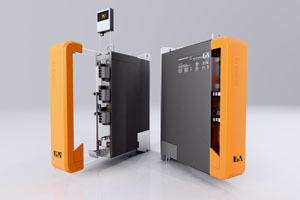 This three-axis servo drive allows space savings of up to 69% in the control cabinet. In spite of its compact design, however, it also features a sampling time of 50 µs for the entire controller cascade. B&R claims that this makes it the fastest servo drive with safety functions on the market. 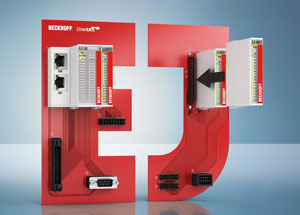 The Beckhoff EtherCAT plug-in module system of the new EJ series reduces assembly and wiring costs and replaces inflexible black-box solutions common in series machines. The principle: the flexibly combinable I/O plug-in modules can be chosen from a wide range and integrated in an application-specific “distribution board”. Prefabricated cable harnesses are used for connection to the machine or plant so that wiring errors will be minimised. The signal distribution board replaces conventional point-to-point wiring between I/O and connector level. eks Engel is presenting a new Industrial Ethernet Switch from the e-light 2MA-family, that fulfills the requirements of the Profinet conformance class B. Thus it can be fully integrated into automation systems such as TIA (Totally Integrated Automation) or CODESYS. Since the switch supports LLDP (Link Layer Discovery Protocol) it is automatically recognized by the programmable logic controllers and can be comfortably integrated into the automation system via GSDML files (General Station Description Markup Language) just as I/O devices. In addition to six twisted pair ports (10/100 BASE-TX), two optical uplinks (100BASE-FX) are also available with which distances of up to 30 km can be bridged depending on the optical fiber type. Redundancy mechanisms such as MRP (Media Redundancy Protocol) enable high-availability ring topologies with a reconfiguration time of 200 ms and less. The new switch from the e-light 2MA-family features two optical uplinks to cover distances of up to 30 km. Kyland Technology is presenting the new serial device server SICOM 3005A. This server facilitates a seamless integration of serial devices into an Ethernet network. Thus transmission distances can be extended to any length and data can be analyzed on a PC or converted back into serial signals at the target location. An integrated Ethernet switch offering comprehensive management, diagnostic and security functions as well as fast ring redundancy protocols, enables easy operation, saves space in the cabinet and reduces power consumption. The Kyland SICOM 3005A has four serial connections and six Fast Ethernet ports, two of which are optional available for fiber optics. 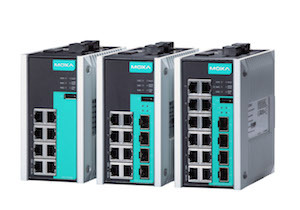 Moxa presents a new class of Gigabit Ethernet switches at SPS/IPC/Drives 2014, the EDS E series, for use in large-scale networks to converge field applications in extreme industrial environments. In addition to Level 4 EMS protection, severe shock/vibration resistance, and new thermal fin design that can reduce switch temperatures (5°C or more), the EDS E series has many user-centric features to significantly improve network manageability, and the new hardware designs are engineered to provide an unprecedented level of switch reliability for industrial applications. The EDS E series features extreme robustness with Class 1, Div. 2/ATEX Zone 2, DNV, NEMA TS2, EN 50121-4, and IEEE 1613 Class 2 compliance. The Ethernet extender from Phoenix Contact can use existing copper wires to easily establish redundant Ethernet ring structures with data rates of up to 15 Mbps. This means that old systems can be cost-effectively retrofitted with Ethernet networks. There is no need to lay any new network cables. Ethernet communication over distances of up to 20 km instead of the usual 100 m is also possible. In addition to the cost savings, the short commissioning time is a further plus point. Once they have been wired, the devices automatically detect whether they are in a point-to-point, line or ring topology and configure themselves accordingly. Old systems can be retrofitted with an Ethernet ring structure quickly, easily, and without any Ethernet expertise. Ethernet Extender allow communication over distances of up to 20 km. Protocol conversion is a key element needed to make the concept of the Connected Factory a reality, empowering plant managers to adapt existing equipment including drives, PLCs and HMIs. Crimson 3.0 software from Red Lion now offers communication support for more than 300 industrial protocols. With just a few clicks, Crimson converts protocols for disparate industrial devices, allowing them to share work-in-process, machine status and other information. 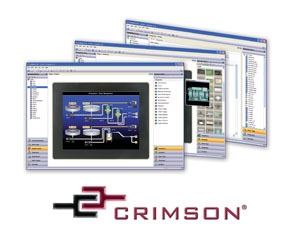 Deployed on Red Lion’s Graphite HMI panels, ProducTVity Station, Data Station Plus or other industrial automation offerings, Crimson gives organizations the ability to easily integrate almost any PLC, PC or SCADA system for data collection, monitoring and control of factory floor equipment from different manufacturers. Crimson 3.0 offers support for over 300 industrial protocols that vary from proprietary to open-source. Renesas Electronics presents its “Connect it! – Ethernet R-IN Solution Kit”. The new kit is an evaluation tool for industrial Ethernet networking. It includes all the hardware and software components system manufacturers need to set up industrial Ethernet slave networks and serves as a starting point for their own developments. The solution kit facilitates integration and helps system manufacturers get their products on to Europe’s industrial Ethernet market faster. 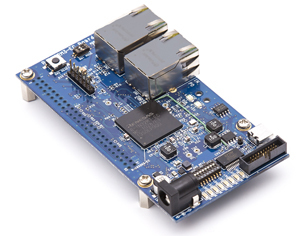 It is based on IAR’s KickStart Kit for Renesas’ R-IN32M3-EC industrial Ethernet communication chip. Renesas’ R-IN32M3 series supports multiple protocols such as EtherCAT, CC-Link IE, EtherNet/IP, PROFINET, CANopen and others from a single device. With the new Sitop PSU8600 Siemens presents its next-generation power supply system: It is the first power supply capable of being completely integrated in networked automation applications and the Totally Integrated Automation Portal (TIA Portal). This reduces the outlay for engineering and operation considerably. 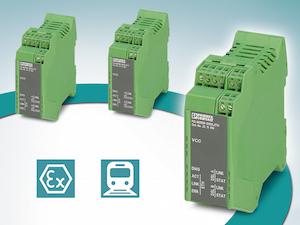 The Ethernet/Profinet interfaces enable users to individually set voltage and current for up to 16 outputs, for example. Depending on requirements additional modules, such as those for buffering short power failures, can be added without wiring effort. Several integrated functions support condition monitoring and power data acquisition, thus enhancing both availability and efficiency. For this reason, the Sitop PSU8600 is particularly suitable for industries that have high requirements in terms of reliability and integration, such as automotive, food and beverages, and pharmaceutical industries, as well as in plant and custom machine building. With the new Sitop PSU8600 Siemens presents its first power supply capable of being completely integrated in networked automation applications. Softing‘s new dataFEED OPC Suite combines OPC Server and OPC Middleware functionality into one compact software solution. The user interface with intelligent, practice-oriented default settings and intuitive user guidance is designed to make it easy for plant manufacturers and maintenance engineers to quickly configure OPC communications. The highly scalable dataFEED OPC Suite provides users with the flexibility to pick and choose only those components that perfectly fit the application requirements. 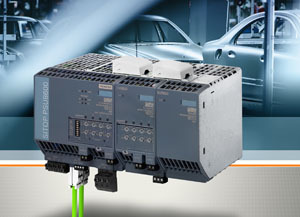 The dataFEED OPC Suite supports numerous industrial communication protocols and offers connectivity to legacy and modern controllers from leading manufacturers like B&R, Siemens, Rockwell, Mitsubishi, or Schneider Electric. The integrated OPC Middleware components provide the necessary platform to seamlessly integrate OPC communications into a larger context. The Softing dataFEED OPC Suite combines OPC Server and OPC Middleware functionality into one compact software solution. The new 750-889 KNX IP Controller from WAGO is designed as a smart solution for state-of-the-art building and system automation. The WAGO-I/O-SYSTEM 750 Series Controller has been upgraded with a more powerful processor than its predecessor. With a program memory that has doubled in capacity and data memory that is four times larger, the controller is capable of managing even the most complex control tasks. It can be incorporated directly into an Ethernet line topology via its integrated 2-port switch. The freely programmable 750-889 KNX IP Controller can link, control, regulate and monitor all KNX devices from a variety of building systems. When paired with WAGO-I/O-SYSTEM 750 I/O modules, other sensors, actuators and sub-buses (e.g., DALI and EnOcean) can also be integrated. 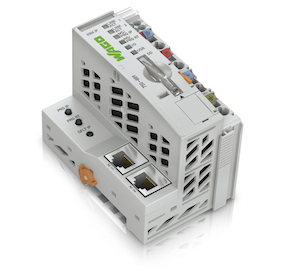 The router function, in combination with the TP1 Module, automatically connects the KNX two-wire bus system to Ethernet networks. This permits building or system operation via a local network or the Internet. The WAGO 750-889 KNX IP Controller can link, control, regulate and monitor all KNX devices from a variety of building systems. 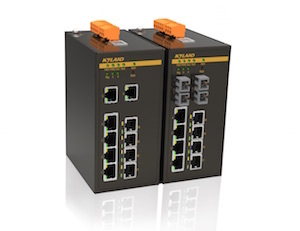 The RedFox Industrial Rack (RFIR) from Westermo is a new generation of industrial routing switch, designed for high network traffic applications. Four new switch configurations are available that can be further customised with SFP transceivers. The RFIR range runs efficiently on AC or DC power and has 19 or 27 ports, including 11 gigabit ports. The RFIR has a MTBF of 297,000 hours ensuring a long service life. The design is developed for use in heavy duty industrial applications and has been tested by both Westermo and external test houses to meet EMC, isolation, vibration and shock standards, all to the highest levels. The RedFox Industrial Rack range is powered by the Westermo WeOS network operating system which is now delivered in 70 different models in the Westermo range. WeOS has been developed by Westermo to allow us to offer cross platform and future proof solutions. WeOS can deliver unique IP security functionality for this class of product, for instance a Multiport DMZ can be constructed by utilising the firewall function available in every port. Remote secure access to a network can be provided using encrypted VPNs. 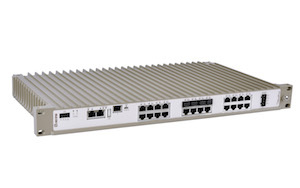 The RFIR is a high performance layer 3 industrial Ethernet switch designed for high network traffic applications.